Pest Expert Formula ‘P’ Silverfish Powder is a powerful permethrin dust which kills silverfish eggs and nymphs as well as adult silverfish. Supplied in an easy-to-use puffer pack to enable precise application to work surfaces, kitchen units/sinks, bathrooms and other cracks and crevices which may be harbouring silverfish. Pest Expert Formula ‘P’ Silverfish Powder is a powerful permethrin dust (0.5% w/w) which kills silverfish eggs and nymphs as well as adult silverfish. Formula 'P' Silverfish Powder should only be used in areas inaccessible to pets and where it can remain undisturbed. Unlike sprays, it can be used safely around plug sockets and electrical devices. For best results we recommend use alongside Pest Expert Formula 'C+' Silverfish Spray as the combination of different active ingredients enables a faster and more effective knockdown of silverfish infestations. Alternatively see our Silverfish Killer Kits for a complete package of the best silverfish killer products on the market. 1. Unscrew the cap to expose the exit hole. 2. Puff directly onto insects, into nests and hiding places of insects. 3. Replace cap after use. 4. Vacuum after 3 hours in sensitive areas. 5. Repeat at weekly intervals or as necessary. In the home: use behind stoves, fridges and other places where pests congregate. In the garden: can be applied directly onto soil to ensure contact with the pests. Use Insecticides safely. Always read the label and product information before use. To avoid risk to man and the environment, comply with the instructions for use. Do not contaminate foodstuffs, eating utensils or food contact surfaces. This material and its container must be disposed of in a safe way. Do not empty into drains. DO NOT APPLY TO CLOTHING OR HUMAN BEDDING. ALL BATS ARE PROTECTED UNDER THE WILDLIFE AND COUNTRYSIDE ACT 1981, BEFORE TREATING ANY STRUCTURE USED BY BATS, CONSULT NATURAL ENGLAND, SCOTTISH NATURAL HERITAGE OR THE COUNTRYSIDE COUNCIL FOR WALES. Remove or cover all fish tanks and bowls before application. Wash hands and exposed skin before meals and after use. Keep in a safe place. Remove excess dust from treated fabrics and air thoroughly before use. If swallowed seek medical advice immediately and show this container or label. 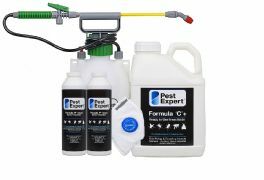 Good quick service from Pest Control Supplies. This Silverfish Killer Kit enables you to carry out a comprehensive silverfish treatment one room, using a range of the best silverfish killer products from market leaders Pest Expert including: Formula 'C+' Silverfish Spray and Formula ‘P’ Silverfish Powder. The combination of insecticides delivers a rapid knockdown of silverfish and helps maintain long-lasting silverfish control. Supplied with full instructions for use. This Silverfish Killer Kit enables you to carry out a comprehensive silverfish treatment to an average size house, using a range of the best silverfish killer products from market leaders Pest Expert including: Formula 'C+' Silverfish Spray and Formula ‘P’ Silverfish Powder. The combination of insecticides delivers a rapid knockdown of silverfish and helps maintain long-lasting silverfish control. Supplied with full instructions for use. Pest Expert Formula 'C+' Silverfish Spray kills silverfish fast and leaves a residue that offers long-lasting silvefish control. This ready-to-use insecticide is safe for direct application to work surfaces, kitchen units/sinks, bathrooms and other areas of activity. A one litre trigger spray covers 20 sq m.